As I was recruiting for jobs a couple years ago, I wanted to make sure I had the entire solar industry dialed in. So, I set out to list out all venture-backed solar startups and cleantech investors. The project took on a life of its own, and I ended up with a decent summary of cleantech startups. So, now I want to share it with the world. The “Cleantech Matrix” includes over 800 cleantech startups, and over 400 investors – with an “x” for investments. This can be downloaded, password-free, from the box.net tool on the right of this page. I’m hoping this will help job searchers find companies, or help entrepreneurs find investors. Now, I haven’t been that diligent about updating this lately, so I may be missing a few dozen companies. Please let me know (either in the comments below, or at thegreenstalk@gmail.com), and I will update the file periodically. Sorry it’s somewhat America-focused. I’m happy to include more international startups if anyone has suggestions. I think there are a lot of cool things that can be done with this data (perhaps a wiki platform? ), which is why I’m sharing it. Let the data be free! Getting a job in the solar industry isn’t necessarily easy. Most technology-heavy firms tend to have one or two business people for every dozen engineers. So in the interest of helping out those who are trying to break in, I wanted to share a few things I learned. My interest in energy didn’t start until relatively late. I started out studying math in college, and then spent four years in management consulting. I went to business school with the hopes of finding a career to focus in. I decided pretty early in grad school that I wanted to do energy, and took an internship with Abound Solar. I had an amazing time there, and then decided that solar was the industry for me. Meet with them over coffee, or have a phone call. Try to ask smart-sounding questions, talk about projects I’ve been working on. At the end, ask them if they know anyone hiring, and ask them to connect me with other people who I should meet. This job search continued the entire second year of my MBA program. I flew to the Bay Area every 6 weeks, crashed on couches, and tried to meet as many people as possible. I read the news; I also read patents about companies that I wanted to learn more about and companies I was meeting with. I did projects – I worked for free (or nearly free) with two Boston startups (one a water startup, another one a waste heat technology). These gave me things to talk about during the networked job search, and they helped me get smarter about how things actually worked in energy startups. Eventually, I landed a job offer. That fateful day, I went from first meeting the team to a handshake offer in under five hours. I had spent nearly 12 months with nothing to show for it, and then closed an offer in half a day. By the time I found this job, I had met with 118 people. If you’re not all-in on the industry, then your odds of success are really low. I’ve known a bunch of people who were half-trying to get into solar. Their success rate so far is 0%. Stop considering jobs at McKinsey or Google. You have to live & breathe your future industry, or you won’t get traction. You might think of it all as “cleantech,” but nobody in the industry calls it that. Solar people work in the solar industry. And solar has very little in common with other sectors (water, wind, biofuels, etc.). The sooner you narrow down to the sector you enjoy most, the deeper you’ll be able to go in becoming an expert in that sector. You don’t have to be ultra-specific, but you should be making your solar/smart grid/water/electric vehicles decisions as soon as you can. Now that you’ve burned your bridges, let everyone know. Tell your friends from school, your friends from previous jobs, and your family. They will bring you job leads. When you don’t have any experience, the best thing to do is get some. And that often involves working for free. It may be difficult to find a role at first. You may have to start with some unglamorous projects, and eventually can help out with business plans, financial models, or work planning. My first project was simply doing paperwork for a government grant application – as unglamorous as it gets. But I liked the team, and it proved that I was willing to do whatever needed to get done. Sure, you’re an MBA. And you used to work for McKinsey. But startups don’t need someone to put their issues into a 2×2 matrix. Earn respect by doing menial work (see the point right above this), and by learning the technology and the market. If you’re a generalist, then expect to do a lot of business development (which usually means cold-calling potential customers or partners). There is a ton of information out there if you’re willing to look for it. Most companies have patents that can tell you a lot about the company’s technology. And they’re public domain – fair game for anyone to read. I use patentlens.com, but any patent search would do the job. Be warned – it’s tedious reading. But you will learn things that very few people know about. And it differentiates you from other job seekers. a. The job search becomes more fun. It’s always nice to feel like you’re helping other people. This creates a positive feedback loop (your confidence makes you more effective). b. You get taken more seriously. When you sound like you know what you’re talking about, people assume that you’re really going to end up in the industry. Senior people may have tons of experience and heavy-hitter contacts… but they have very little time to help you out. Junior people make up for their lack of seniority with their willingness to help. I got way more help from people my own age than I did from people my father’s age. If you want to work at a Silicon Valley startup, then you have to come out to the valley on a regular basis. Early-stage startups don’t have a hiring budget – so they don’t travel. And they don’t hire over the phone. Do the math. I genuinely found the solar industry really interesting. This was important because I was then willing to do work even if I wasn’t positive that it was worth it. It’s difficult to convince yourself that reading a patent (or ten of them) will lead to a new job. But if you can find a way to enjoy reading the patents, then the professional value just becomes a bonus. Renewable energy isn’t yet competitive with the grid. That’s no surprise. However, it’s an unfair fight. And I’m not talking about carbon pricing (which would be nice). I’m talking about the fact that renewables will deliver energy, with zero fuel costs, for 20-25 years, while they are being compared against today’s spot price for electricity. And while electricity prices may change, the energy out of a solar project is locked in as soon as you build it. In other words, renewable energy plants provide a hedge against future energy price changes. And electricity prices have a good chance to increase in the future. Historically, they have grown by about 2% per year, but many smart people think they will grow at faster rates going forward. That benefit is hard to bake into today’s current LCOE calculations. But if the price of electricity is rising, then the true comparison for a renewable source is not today’s price, but the average electricity price over the next 25 years. I’ve created a metric called “Burdened LCOE”. For this, I’m simply starting with today’s energy rates, and then growing them over 25 years, at different growth rates. 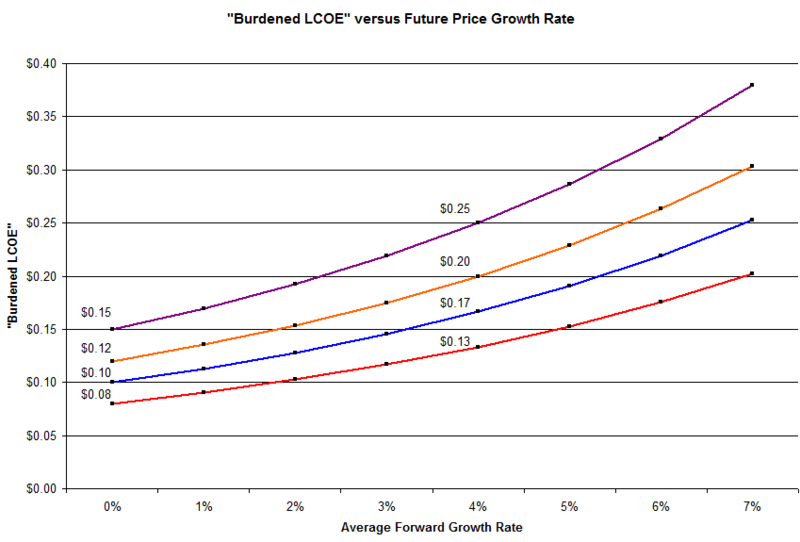 The 25-year average is the burdened LCOE. The impact is significant. A customer paying $0.15/kWh today would actually have a burdened 25-year LCOE (with 4% annual price growth) of $0.25/kWh. In other words, someone would be just as well-off by buying a solar system with a $0.25 LCOE as they are if they pay $0.15 today, expecting prices to go up by 4% per year. Someone paying $0.12 today would expect to pay an average of $0.20 over the same horizon. Seen through this lens, renewables are much more competitive with fossil fuels. Natural gas prices may increase. We have a lot of supply, but limited refining capacity and port capacity for importing LNG. That’s the extent of my knowledge – for people who know what they are talking about, surf over to The Oil Drum. Coal plants are not being built. Activism and NIMBYism are preventing nearly all new coal plants from being built. See Earth2Tech’s coal death map. So supply of electricity cannot keep up with demand. Prices rise. Maintenance costs will likely go up. This is related to the fact that no new plants are built – therefore, old plants have to be kept running beyond their planned lifetimes. Maintenance costs begin to escalate. Look, I’m not trying to convince you to buy electricity futures. But I am trying to get you to cut renewables some slack when comparing a 25-year generation asset against an electricity spot price that may go up tomorrow. Fundamental Driver 1: In IT, the key is often finding or creating a market. In cleantech, the market is usually there; instead the key is cutting cost. Operational experience and ability to execute is going to be more important than creativity and the ability to anticipate demand. Long-term, there will be margin pressure. Since the final product is usually a commodity (electrons, or fuel), there is not as much ability for cleantech companies to achieve or sustain significant price premium. The market is already huge. This counters the margin pessimism in #2: while startups may not be able to increase prices, they should be able to sustain margins if they are able to dramatically reduce costs. There will be fewer garage-startups, and fewer mini-spinouts from large firms (a la employees leaving Oracle or IBM to start their own business). Labs, both academic and government, will be far more prominent in supplying technologies – and the ability to find & license IP will be critical for early-stage entrepreneurs. Landmarks are different: rather than getting customers early and iterating product & features, cleantech companies must hit laboratory technology milestones, pilot projects, and extended-life stress testing. Bootstrapping becomes much more difficult – very few companies will go from concept to IPO without private funding. There will also be fewer mega-wealthy entrepreneurs, because maintaining equity will be more difficult. Given the longer time from concept to revenue to IPO, there will be fewer serial entrepreneurs. There may be an opportunity for entrepreneurs to specialize in companies that are in specific stages of development (e.g. proof of concept, sales ramp-up, or manufacturing scale-up). In some specific industries, experience from related fields is highly valuable. Semiconductor experience is valuable for solar PV; oil & gas and biotech experience is valuable for biofuels. It’s sometimes more difficult for VCs to add value. Certain things transfer well: the ability to bootstrap and manage cash during rapid growth, and the ability to navigate government/regulatory issues. However, technology expertise and market knowledge don’t necessarily translate across diverse sectors.